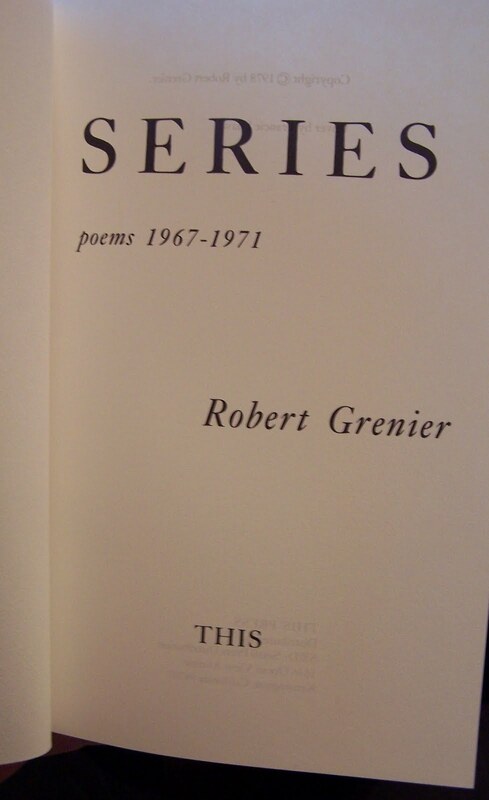 Above is the title page of Robert Grenier's collection SERIES: Poems 1967-1971 [Kensington: This Press, 1978]. It should be understood that this bracket of work/time is not wholly representative of the range of writing Grenier did in those years. 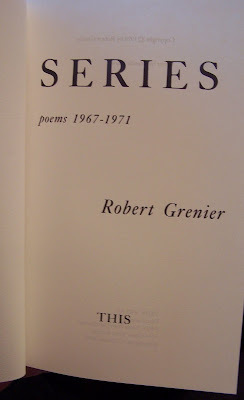 Grenier was working during this period on many of the poems that would eventually find their way into A Day At the Beach [New York: Roof Books, 1985]; and there were poems that he had written between the publication of Dusk Road Games [Cambridge: Pym-Randall Press, 1967] and the beginning of the period of his temporary appointment in the English department at Berkeley [Fall 1968]--in addition to others from the early 1970's, which have never been collected, but probably never will be--poems that were submitted in manuscript (under the title Water Farmer, and rejected) to New Directions in the late 1960's. Those poems in Water Farmer would have made clear--had they been published, as Grenier's second trade collection--the bridge between the early "discipleships" to Frost, Lowell, Justice, Ashbery and Creeley, and the kind of works, initially inspired chiefly by Creeley's Pieces [New York: Scribner's, 1969], which would break cleanly from tradition, to become the minimalist triumphs of A Day At the Beach, and Sentences [Cambridge: Whale Cloth Press, 1978]. The crisis of Grenier's work, which occurs between the last works published in Dusk Road Games , and the earliest poems in Sentences , took place over a 5-7 year span, a relatively short period, in retrospect, but one in which he was confronting the contradictions inherent in his earliest apprehensions of the possibilities of traditional avant garde verse (a la Williams and Pound), and attempting to reconcile a psychological resistance to formulaic constructions, by focusing on smaller and smaller particles of language. This alienation from prescribed (and proscribed) linguistic formulae went through a distinct phase in Series, specifically the section entitled FALL WINTER FAMILY HOME, dated August 1970 / January 1971. In it, we can see the breakdown of the sentiment-in-words which had characterized nearly all of his work up to that point, a methodical deconstruction of the Poundian commitment to genuine speech and the Objectivists' adherence to a valid (emotive) content. Grenier's earliest successes had been characterized (in the first two sections of Dusk Road Games) by a sweetly innocent honesty of emotion, with delicate turns and picturesque youthful tropes of marriage, parenthood and pure physical joy. His attempt to salvage these traditional thematic relationships was bound to be lost in the purification and steady winnowing down of syntax and elaboration. This crisis was formulated in FALL WINTER FAMILY HOME as a dialectic between capital and lower case letters, with capitals represented as symbolic titling, signifying commands, announciatories, subjects, objects, symbols, colloquialisms, queues, or any preemptive platform from which to launch a resistant or playful response. The campaign against titles--and capital letters--as symbols or signs of authority--both real and "verbal" (the King's English) , signals a kind of guerilla conflict (or pitched battle) against SPEECH. Capitals stand like the names over the capitals of buildings, as public displays of advertisement or enforcement in the community. Thus in Grenier's work CAPITAL letters are parodied, mocked as the evidences of power, ignorance, unconscious threat--as, in effect, power centers of language. The alienation of the individual consciousness from inherited language, from the givens of "public" speech, creates a tension in utterance which places the speaker in an ambivalent position with respect to assertion and sentiment. If the archetypes of language--its nominatives, relations and unnatural significations--dominate the speaker, there are plenty of stand-ins to address. In a capitalist sense, language is the currency of exchange or the promulgation of law--language facilitates exchange, and becomes the instrument of persuasion and expansive fulfillment. In a socialist sense, language may be the shorthand for exploitation, the tissue of half-truths or outright lies which muddy the waters of sense and equality. A psychological interpretation of the archetypes of language as a tainted inheritance of a damned culture; a paranoid rejection of the prevalent ideological roots buried in language might be any sensitive reader's familiar disaffection. True freedom may exist only through a redefinition--or purification--of language itself. Poets habitually face the resistance of received signifiers, to express a unique vision of reality. This seems to me to be an over-riding preoccupation in Grenier's quest for an artistic space that is wholly unique, and completely his own: The compulsion to resist the given, to separate oneself from external influences, and to invest a discrete space with hermetic elements (drawn characters). In FALL WINTER FAMILY HOME, Roman capitals are isolated, treated as distinct phenomena. I noticed as early as 1968, that Grenier had a distinctly "designed" handwriting, in no sense traditional, or based on any script styles he may have seen in school. It was clear--though I wouldn't have been able to summarize my sense of it then--that he was defining himself through a deliberately eccentric printing style. His writing wasn't "neat," it didn't "flow" or organize naturally into a dominant rigid structural grid. In short, he was seeing letters as individual entities; individual words were "speaking" to him in ways that were far more interiorized and sensitized than they are for most people. The objectification of individual words, and even individual letters, as evocative signifiers, apart from their function in sentences and phrases, allowed him to see them as oppositions, as sign-signifiers, often self-reflective, inherently contradictory, or bristling with (either amusing, or terrifying) connotations. Words could generate physical movements or echoes which were sufficiently autonomous (vivid) to stand alone, or which might serve as backstops against verbal ricochets. An exchange between capitals and lower case print could create a dialectic between "wisdom" or "law" or presumed function on the one hand--and protest, critical regard and amused play on the other. In FALL WINTER FAMILY HOME, Grenier teetered on the edge of a complete abandonment of the sentimental "voice" and "persona" of his earliest commitments to the Pound/Creeley injunctions to invest in emotionally honest stances (and speech), in favor of a de-personalized object status, in which address is not a condition of the projection of a speaking voice, but a manipulation of parts of speech, broken down into manageable size, and re-constituted as non-literal data. One might hope to imagine that each of these "poems" was seen, or occurred, on a single page, isolated within the whiteness of a surrounding unoccupied space. The metaphor has a separate significance in Grenier's work, too, of a dreadful or liberating white snowy expanse, a covering, drifted nothingness of a Minnesota Winter landscape. Nonetheless, their particularity and isolation as facts of being inhering as unconnected, disconnected images OF words is overpoweringly present. The capitalized words denote an object status which is not a projection of the writer's intention, but substantial presences or structures with their own integrity. Notice how the capital V, in "VOLUME" or "DEVOTION" functions as a literal wedge or blade in space. The words seen as literal resonances of their own structure, like a harp vibrating in sympathy with a rumbling train sound, or the neighbor's lawn mower singing the song of your homely vacuum cleaner. In "SLUSH//splashed her" the word slush acquires its own literal symbolic convexity as the very thing itself. Williams's admonition to have "no ideas but in things" here is carried one step further: This isn't an idea in a thing, but words as things themselves. Not words as signs for things--"no signs//of things"--but things, simply. The "writing" consists then of elaborations upon literal facts. "PLOWS" go "by" but the sliced off go signifies the precision of the passage of the snowplow's blade as it carves the white mass of snow. Its going is animated by (the word) "by"--the y itself, its slanting acute descender like the angle of the blade. A capitalized "Y" is different from the lower-case "y" since the capital supports an equilateral upright angle supported by a vertical pillar, whereas the lower-case creates a straight y/ tilted line. The apprehension of alphabetical structures is a key to Grenier's preoccupation with the visual "language" of shape, which vies at every point to influence, or dominate our sense of the meaning of letters in space. In "BLOCKS AWAY" the blocks become the literal rectangles of built structure, and there's a movement by increment of the sized proportion of that rectangularity as an interval of literal form. BLOCKS literally block out the metaphorical space of their area. I find myself using this word "literal" over and over in a discussion of these poems, because it defines what is happening here. "SHARPS//in the cold" makes the word sharps black, as if the sharps were the black keys on a white keyboard. The duality of black/white, brittle(echoing)/(in the) cold, dry clarity versus soft (flat) heat. There's a literal spin or spiraling in round/and round//and round/the roads of//CAPE ANN which delights in its ability to create movement through circularity and propagating conjunctive line-breaks, resolved, like a ditty, in the elegant, poised, purity of "CAPE ANN." If it's a "poem" it tells us nothing about the place, or our experience of it, except the motion of our passage in a vehicle, of which the poem is the literal metaphor. The capitalized CAPE ANN functions as a place-holder for the placeness of a literal location on the earth, its nominative object status as a memorable recorded instance with real historical roots. The reader is "there" only in the fleeting sense that he has ridden round it, whereas the literal fact of the place remains untouched, and emptily present, a nowhere in the middle of blank space. Again, the isolation of the words, disconnected from normative syntax and specific referential values, signals an alienation from the given set of signifiers, allowing them to be seen as separate entities, with their own integrity, their own oscillating connotations. In "Maine//WILLIE" there is a quality of connotation that is wholly gratuitous to the literal meanings of the individual words. Each is a name (a noun), which stands for something. Maine is a specific space, a "state" of landscape; Willie is a person's name, but otherwise completely non-specific and generalized. Nonetheless, the "Willie-ness" of the name Willie is connected to a site-specific generic identity through the linking to a broadly geographical referent. There is an overlap of generic connotations, which creates a common intersection of senses of meaning. The place-name Maine is placed in traditional capitalized form because it has an immovable identity as a given referent; whereas Willie has a human, genetic variance peculiar to a given set of possible individuals, all of whom share the name Willie. Whatever it is about the name Willie that might suggest Maine, is not relevant to the constructed relationship which the poem sets up. If there is any gratuitous humor ignited by our sense of the name Willie, it can have no other meanings than what the poem grants us. It's an illogical equation which "doesn't work" except by improbable accident. Whoever Willie is, he may be from Maine, or he may never have set foot there, but he is in some proximity to a place-holder ("MAINE") for a place in space. A state and a person have been de-constructed and allowed to conjoin in the literal space of a printed page (or a projection of shapes) in space. On the same level, "YELLOW//boots" opposes a color which is then modified into an adjective by the addition of the words "boots." YELLOW functions initially as nothing but a literal color, but then is "assigned" an adjectival value as the suggested application (of the cliché) to rubber, canvas-lined, boots. The color yellow has no shape, isolated from any applied syntactical context, until it is turned into a modifier by the addition of AN-other noun, whence it becomes a compound nominative phrase, a descriptive referent. Again, there is a generic non-specificity which treats the universe of known (named) objects as categorical distinctions only. These boots don't belong to anyone, are of no given size, and exist in no specific context. They may as well not even exist, in the sense of having a meaning or substantiality in any probable narrative of use. The poem, again, is a "universal" equation which defines two qualities--a color and a physical object--through the occasion of their applied linkage. By setting the two words in vertical relationship, their natural syntactical connection is thwarted, or at least brought into question by this arrangement. By setting them together and apart in this way, their separate integrity as individual words (as things) is preserved, until they are set into motion by syntax. Syntax is a kind of inertia, which, once allowed to gain momentum, creates a music of continuity. Objectifying that inertia, cutting it up into its constituent parts, and then arranging them in unlikely orders or positions, allows their discrete character(s) to be exposed, played and replayed. YELLOW is capitalized in order to show its fluid (liquid) physical quality, against the three-dimensional denotation of boots, a familiar form. Color as non-specific dimension (visual) literally applied to a form: Color (a certain wave-length of visible rays as perceived) paints the object as supplied. These BUILDING BLOCKS of the alphabet suggest an ultimate deconstruction of language, which is exactly the direction Grenier's work would turn in the years following the publication of Series. Sentences evolves directly from the de-constructions of FALL WINTER FAMILY HOME. The vastness of Sentences opens out into an unbound set of instances, in which place, person (identity), and time (occasion) are all relinquished in favor of discrete fragments, formulae found, obsessively, or randomly, in the detritus of the common day's tasks. Its universal applications are freed from context, and are like annotations (captions) to a story never told. Everything's exposed but nothing is divulged. Let it be known your "christian" pal Olson not only has defamed me on his most recent rant (re what he takes to be "conservatism"), he has not posted my two responses (which are quite civil and reasonable in tone). Some of us read Locke, and Adam Smith. He obviously hasn't, but just offers his usual pathos and generalizations, along with those of his little neo-con pal DeLater. I'm fairly convinced Olson's mentally ill, if not criminally insane. Not merely paranoid and irrational, but verging on psychosis (note his odd, blithering response to my post on Locke). Thanks, Curtis, for this great appreciation of Bob's work. Tom: Thanks for the encouragement. Fabulous essay and reading, Curtis! You, along with Crag Hill (http://scorecard.typepad.com/crag_hills_poetry_score/2011/02/found-this-essay-lurking-on-my-hard-drive-written-sometime-in-the-1990s.html), write some of the very best and most intelligent understanding of RG's poming that there is. In a couple years, when _Black Spring_ does "a Bolinas Issue," I do hope that I can get this and/or other seriously exact Grenier readings from you for that study. Again, Bravo! I love your writing! Check out my other Grenier pieces--on "JAR" and Phantom Anthems.